weight of empty versus full of bees and honey TBH ? Posted: Sat Mar 28, 2015 9:23 pm Post subject: weight of empty versus full of bees and honey TBH ? does anyone know what an empty hive weights ? versus a full of bees etc hive ? And...i was wondering...about strong winds blowing the hives over ... about to build some TBH for the Welsh hills and last few days winds blew a plantpot of mine over down not in the valleys as they say but lower land. any experiences of high wind issues ? maybe more legs could be added to the hive ? or tie them to posts ? i am about to build my firs TBH by the way ! I didn't weight mine before they had bees in them, but I've got all the wooden components ready for assembling into two new hives - not precisely the same size as a 'Chandler' hive - mine are 1 meter long, 15 inches at the top, 8 inches at the bottom, 9 inches deep (all internal dimensions, sorry mixed units, but you should be able to work them out), and whatever number of bars and follower boards. Then add legs, roof, mesh floor, bottom-board, etc. I reckon my two hives come to 29 to 30 kg each empty. And with bees and winter stores, something like 20 to 25 kg heavier (I lift each end with 'luggage scales' and add the two numbers together). So I reckon these two have plenty of stores, and aren't going to blow over in my non-exposed situation - perhaps that can be a problem in more exposed areas? I live in an exposed position on the edge of the Yorkshire Dales. There's nothing between us and Morecambe Bay, which is where the wind comes from. The only problem I've had with high wind is the roof coming off (top-bars not disturbed). I use hive/luggage straps to keep the roof on. One hive on a sloping steel roof has moved during an exceptional storm, but is now roped to the roof! thx for replies ! 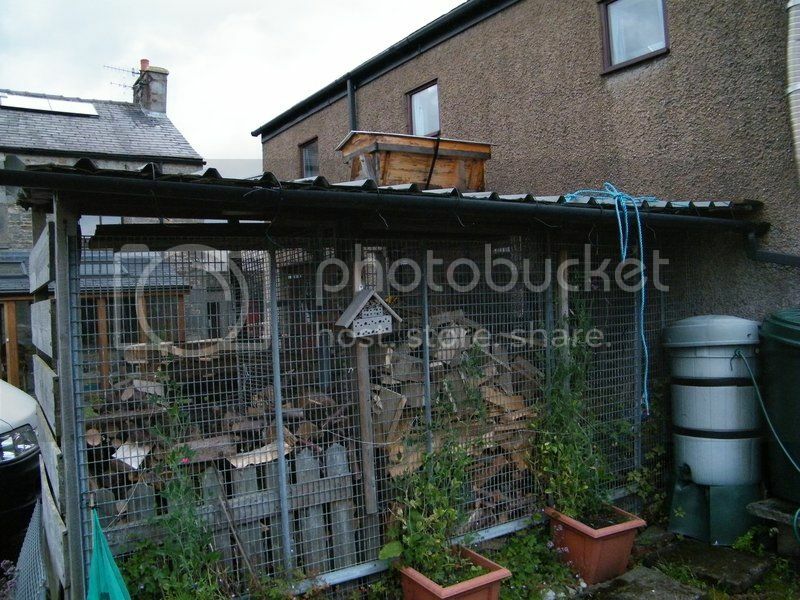 wow some pic of hive on roof lol !